The tag said that this was a crocodile, but I'm pretty sure that it's a alligator. My husband just mentioned that this particular fake reptile made him a little nervous, and I come downstairs and find this. I know that there's a perfectly reasonable explanation. 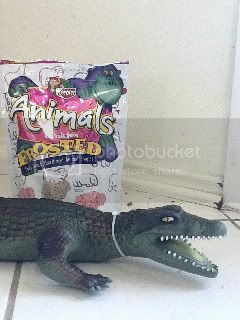 Alligators don't like frosted animal crackers. They do like marshmallows, however. I learned that from watching True Blood. You can actually learn useful things from the television, I don't care what all those psychologists say! I was about to go on a tour of the swamps of Louisiana with marshmallows for snacking, and now I know to take chocolate instead. Why are they called marshmallows, anyway? And there isn't any ham in hamburgers, so why are they called that? Who decides this sort of thing? Is there a government office somewhere? If so, where do I apply? I can't talk about politics around here because there are too many Republicans who have concealed handgun licenses. I refuse to own a gun, however, because the rule in our house is that if you kill it, you eat it. There isn't enough ketchup in the world. Say what you will about Tom Cruise, I kind of like him in action movies. Of course, he doesn't do very much talking in those movies, which is a plus. My cat Pounce is sitting on the printer next to me, like a vulture. Does she know something? My thinking is pretty random today, isn't it? This is my last "work-free" day. Technically, anyway. I've already been logging in from home, trying to figure out some computer glitches here and there. Serves me right for answering the dang phone. It has been wonderful not thinking about work. Someone needs to give me a couple million dollars so I can stay home all day and just be a philanthropist-type who wears big hats and 'lunches'. I could learn to love big hats, if I got free lunches out of the deal. I'll learn to love anything if it's attached to a couple of million. Hope you're having a good day off! Education provide logic and reasoning to over come superstitions. Education increase the ability to think from a broader view and help people believe on natural happening instead of superstitions. Students who looking for content writing, essayshop.org can help them. The definition of education is that "the process of receiving or giving systematic instruction, especially at a school or university." In modern life education become a head ache for the students because of the heavy home work loads. Mnay college essay writing service are providing help for them. The basic syntax of essay writing is introduction, body and conclusion. The introduction will give the correct direction of essay topic. That is the introduction paragraph can identify the topic as well as the subject of the essay chosen. In body part the writer can scan the selected issue. Here we should elaborate the key points related with the issue or topic. Finally conclude the issue. I am so glad to have a chance to read your wonderful article. I am looking forward to read more of your works and posts. Keep up the good work. Hey! Very interesting blog! I wanna tell everyone about the best help for students! This is a cool website best-custom-essays.com which will help to solve your time and keep your good mood! Really very horrifying fake reptile. The author is very talented and creative, it looks like a living one. This is also the quality writing source for everyone www.grand-essays.com who want to succeed in premium original academic assignments writing and get high grades. You do make an excellent point. Being positive without any concrete action is wishful thinking. On the other hand, being negative with concerted action can college-paper.net be self-defeating. Both healthy attitude (grounded in reality) and effective action are needed to maximize the possibility of good results.